Catch the Comet is a fast paced and engaging energiser activity that will get the adrenaline going and the group chomping for more activities. This versatile activity needs a large space. One of the props needed for this game, is stockings, only the ones that reach knee-high. These are quite easy to obtain and, if possible, should be a bright neon colour for added effect. Take a tennis ball and shove it into the stocking, try swinging the stocking around a bit, so as to get the ball right into the end. Hand out stocking and tennis balls to the whole group, each placing their ball into the stocking. When everybody is ready, you can have everyone stand back a little and demonstrate how to swing and throw. As you are going to be throwing an object around, it is advisable to do this activity outside. Take the stocking and ball, hold the stocking at the ‘tail end’ with the ball dangling down. Start swinging the ball around, making sure to release the stocking and ball in the correct direction, which is vertically up into the air, not towards the ground or aiming at those standing nearby. The stocking and ball should look like a comet sailing through the air, with the tail flowing out behind the ball. Eventually what goes up, must come down but you must try and catch the ‘comet’ by its tail before it crashes to the ground. Have everyone throw and catch their own comet. 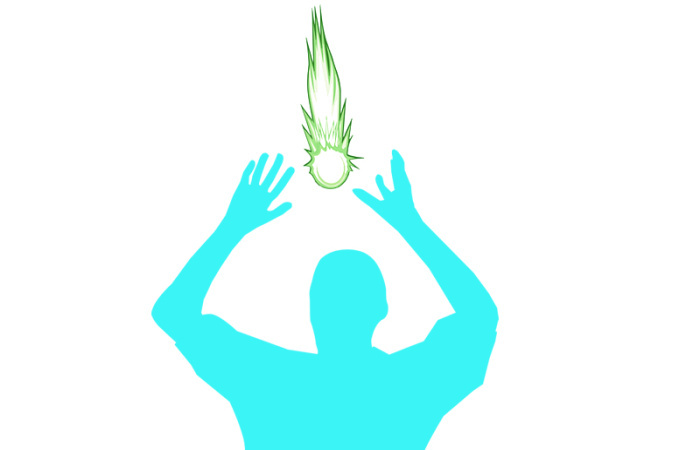 You can increase the challenge by having two players toss their ‘comets’ into the air and they must then catch each other’s comet at the same time. Continue with the activity for a few minutes and then have the pairs stand further away from each other. Now let them try the activity again, not so easy this time. This is a wonderful game to use on its own, or it can be an added bonus activity for those arriving at a workshop or programme on time. The activity is very addictive, and everybody will want to have a turn catching their ‘comet’. There are also many fun variations, see below for more ideas. There are many ball games out there, which aid in improving fine motor skills. Simple ball games of catch, but there are also more challenging games. The next activity, which uses a simple stocking and tennis ball, will definitely challenge your ball skills. Prepare before a workshop or programme by placing the tennis balls into the stockings. One stocking and tennis ball for each member of the group. Once you have everyone gathered together outside, hand out the stockings and tennis balls. Once everyone has successfully done this, have each pair stand a little further apart from each other, which makes the game a bit more challenging. Continue the game for a further 10 minutes, or add a variation. You can use the normal flesh coloured stockings for the activity, but the neon ones do add a bit of flare to the game. One of the ways you can get hold of a number of tennis balls is to ask your local tennis club. Many times, they throw away their old tennis balls, you could ask for these and maybe get them for free. There are also places where you can purchase stockings at wholesale prices, just look around, the factory stores are usually quite happy to help out. You may have seen a version of ‘Comets’ in the stores, as there is a commercial version available. These, unfortunately, will costs a lot more than a simple stocking and tennis ball. The stocking also tosses much better, as it is more elastic than what is used in the shop version. Be aware, performing this activity near trees may not be such a good idea. The mesh stocking will inevitably get stuck in the branches, so pick a nice open space to play. Did you find tossing or catching the ‘comet’ more challenging or were both difficult for you? How did you challenge yourself in order to catch the ‘comet’ successfully? Was tossing or catching more enjoyable? When in a group, how did you catch the most ‘comets’? Catch the tail: have everyone catch their ‘comets’ by the tail only, as it is too easy to catch the ball. Left, or right? Everyone has a dominant hand, have everyone use their non-dominant hand for an extra challenge. Between the teeth: See if somebody can catch the tail of the ’comet’ with their teeth before it falls to the ground. Impossible? Give it a shot. Teams 1: Have paired groups come together with another pair and form four people. Everyone must try to toss and catch their ‘comet’ at the same time. Teams 2: Split a larger group into two teams and provide only one team with ‘comets. Have teams stand a distance from each other, about 30 metres. When ready, let the team with the ‘comets’ toss them into the air. The other team must then try to catch as many as possible. Continue for a few rounds and remember to keep score. Make sure everybody understands the toss is just as important as catching. Each team must coordinate properly in order to obtain a high score. Horseshoe Comet: Take a hula hoop or other fairly large container, place one at each end of the play area. The hula hoops should be at least 10 to 20 metres from each other. Hand out a number of ‘Comets’, divide into two teams and have them stand behind each one of the hula hoops. The teams must now toss their ‘comets’ into the hula hoop furthest away. The team that gets the most inside the hoop, wins, or continue the game for 10 minutes.